Ringo Válvulas was established in year 2000 by former management and staff of Walthon Weir Pacific (WWP). Our personnel have more than 30 years of experience in design and manufacturing of on-off and control valves. This experience & quality of our products makes Ringo Válvulas, one of the companies more competitive in our sector. Best supplier for Spanish nuclear market and a prestigious brand in other sectors such as oil & gas market all over the world. Since 2000 Ringo Válvulas has experienced a fast growth in the staff from 8 to more than 100 from its foundation. Thanks to our experience we have become the 1st Spanish export supplier of valves in with about 80% of our production for export outside Spain, having manufactured more than 10.000 valves installed in more than 30 nuclear power plants in 17 different countries. On 1 August 2013, Ringo Válvulas joined the SAMSON GROUP, the largest industrial valves group in Europe. This was an important milestone in the Ringo Válvulas history since it has involved an increase of sales force that has allowed Ringo to enter into some new markets through the more than 70 sales offices that Samson has all over the world. 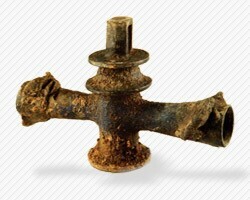 Hydraulic valve Bronze Age I D.C.